Dogs and monkeys did it. So did American men, though some were, strictly speaking, unqualified. So did Russian women, early on. Why, then, did NASA balk at putting an All-American Girl in space? This sharply pointed narrative adds a chapter to a growing history that treats the exclusion of American women from the professional mainstream—to say nothing of extraordinary pursuits like journeying to the moon. Debut author Ackmann (Women’s Studies/Mount Holyoke) opens her tale with a telling vignette from way back in 1957, as a crowd of reporters surrounds test pilot Jerrie Cobb on the tarmac as she’s about to nudge an Aero Commander above its record altitude of 27,000 feet. “Why does a pretty young girl like you want to spend her time around the dirt and grime and noise of airplanes?” one of the reporters asks her. Cobb and 12 of her peers—practiced aviators all, some trained or inspired by WWII female vets who had ferried flotillas of bombers across the oceans—would hear such questions again and again as they competed for spots in the Eisenhower- and Kennedy-era space program, undergoing the same daunting physical tests to which Mercury astronauts such as John Glenn were subjected. Though NASA administrator Randolph Lovelace speculated that women would fare better in space than men (if only because they weighed less), Ackmann writes, his higher-ups pulled the plug on the program even as the Mercury 13 proved their worth. When Cobb took their case to Washington, then-VP Lyndon Johnson objected, “If the United States allowed women in space, then blacks, Mexicans, Chinese, and other minorities would want to fly too.” And thus, though the legendary test pilot Chuck Yeager had argued in their favor, these highly skilled fliers were grounded, leaving it to the Russians to put a woman in space fully 20 years before the American government saw fit to do so. A shameful episode exposed with thoroughness and a graceful pen. 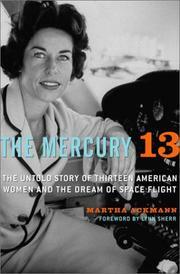 Highly recommended for students of the space race and women’s issues alike.